Florals and leopard are probably my two favourite prints, but it’s not often I wear them together. I regularly combine each of them with stripes but I think this is a first. I wore this outfit for dinner at a local restaurant on Friday night. There had been a light dusting of snow but not enough to preclude walking home afterwards, though I feel I should point out that although these leather leopard print boots have have a heel, it is low by my standards and they have a good grippy sole. It helps too that my boyfriend is tall and strong, so I could stride out confidently knowing that falling was never an option! 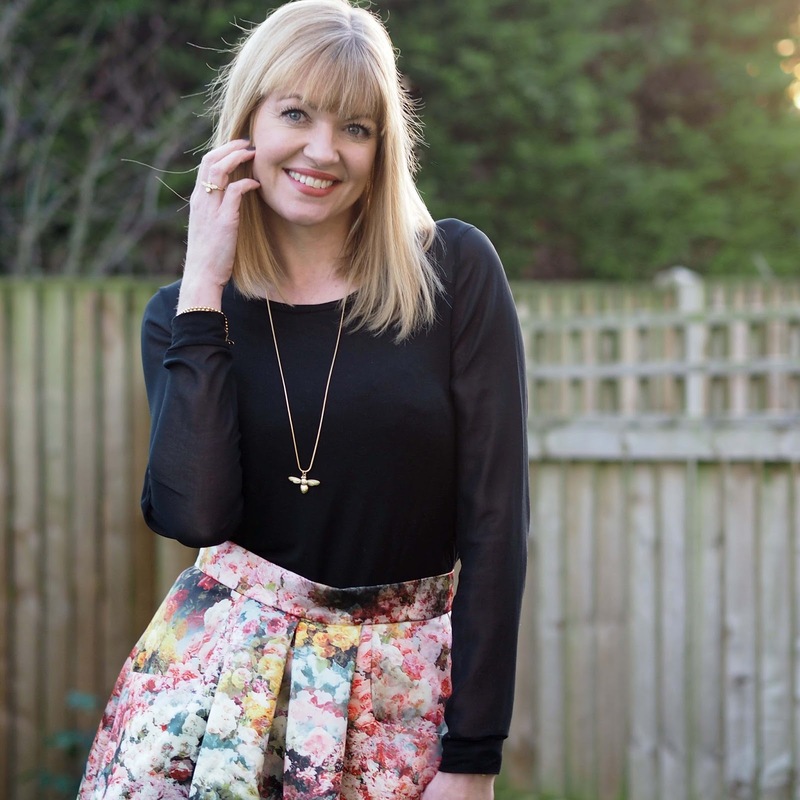 The satin floral midi skirt is one of my favourite skirts from last year, (I wore it here with the same top, a statement necklace and orange shoes). Versatile enough too to wear with a short sleeved top and sandals, it is another hard-working piece and we all know that I like a wardrobe multi-tasker. The painterly-style print reminds me of a Monet watercolour with its blurred, blended colours and I absolutely love it. Both the Danon honey bee and pineapple jewellery are becoming my current favourites. I love how delicate these bracelets are, yet they are packed with detail. The long honey bee necklace is lovely too; easy to wear and sits beautifully. This jewellery is also available in silver and is from my online accessories boutique, Lizzy O. If you sign up to my monthly newsletter (in the right hand side bar of my blog when viewing on a tablet or desktop), then you’ll get an exclusive discount for Lizzy O in every newsletter. The leopard print boots are currently half-price so it’s a good time to invest, especially because they’re leather too. I think they can be worn not only in the snow but through to late spring, perhaps with a floral tea-dress or with jeans and a breton top and then in autumn and winter again. I have said often that I treat animal print as a neutral because it works with numerous prints, colours and outfits. 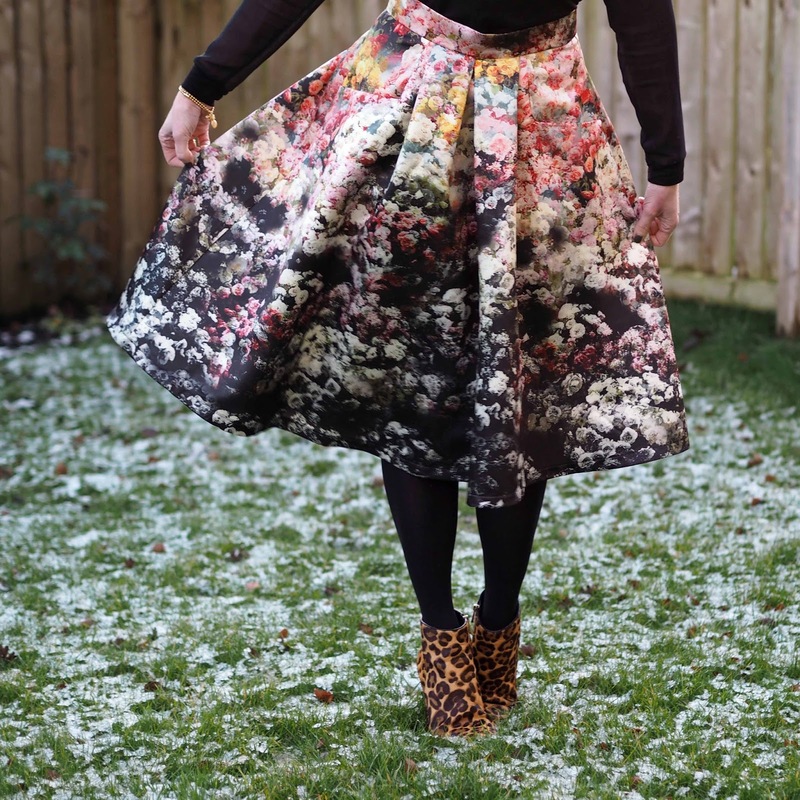 *Sarah” floral satin midi skirt, £39, Aspire Style. Honey bee ring in matte gold, (also available in silver) £24 by Danon at Lizzy O.
Pineapple and honey bee bracelets in gold (also available in silver), £27 each, Danon at Lizzy O. Please follow me on Instagram and Facebook for more of What Lizzy Loves. Beautiful skirt Lizzy, very painterly, and looks edgy with the boots. 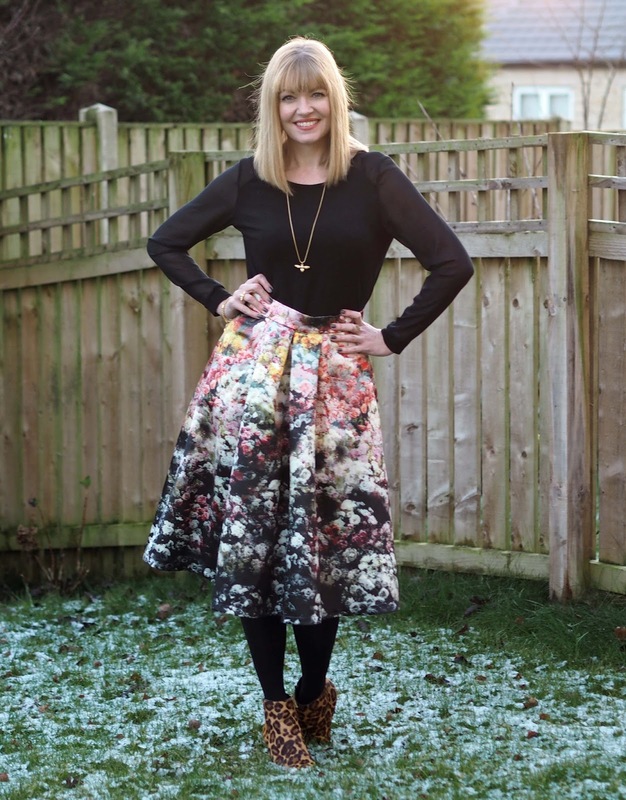 I wouldn't think to put leopard with floral but I certainly will now – it looks great! You had more snow than us, it was barely visible! The floral and leopard is fun, Lizzy! Thanks so much for linking up with us!